Groom your website pixel perfect! We understand the requirements of website owners. Therefore, we ensure that our conversion of PSD to XHTML appeal to leading search engines. Trust us to develop a site that is exclusive and ranks high in the search engines. Our specialty lies in the fact that we provide clients with quality solutions in any situation. More specifically, we always make sure that we develop W3C valid, handcrafted; search engine optimized, mobile friendly and cross-browser compatible CSS/XHTML code. W3care has goodwill in international IT sector for providing best and quick PSD to html conversion services. We have team of experienced and professional XHTML/HTML designers. We have been providing PSD to html services for almost a decade. Our team makes sure that clients are satisfied with our work and happy with our services. Team knows that good support means good work and for that we offer multiple communication channels. We at W3care provide best designers to convert PSD to html India at affordable price. Our clients have given us the title of best PSD to html5 services provider. Get in touch with us to discuss your requirements and customization needs and slicing, conversion, integration. 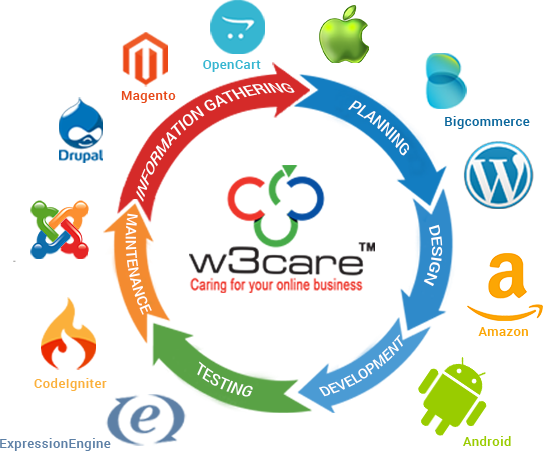 W3care Technologies is a mobile app and website development company since 2010. We have been in IT industry for more than 8 years and successfully delivered hundreds of projects to clients all over the world. We have dedicated team of designers who are expert at PSD to XHTML/HTML 5. Our designers and developers team follow the W3C standards for every project. Our quality analytics team takes care of website functionalities. I hired Dipal and W3care to create and expand an existing Logo and brand that I had created. Dipal was extremely responsive and worked hand in hand with me to complete the project. I had numerous revisions and I am completely happy with the end results. I highly recommend Dipal and the W3 team to anyone looking for graphic designer work. You won't be disappointed...Team Throw!